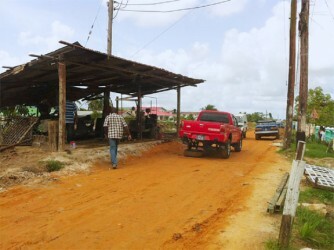 Despite his repeated efforts over the last three years to stop the blocking of traffic along Niles Street, Grove, caused by a workshop that operates on a reserve alongside the road, resident Yubraj Rambarran says that authorities are yet to act. Rambarran stated that he reported the situation since 2010, but this only resulted in him being asked by local authorities to allow the owner of the workshop, whom he identified as “Pooram,” to continue his operation, which is his only means of income. Rambarran said he agreed that the man could continue operating under the conditions that he ceases blocking the road and stops making excessive noise. However, Rambarran complained that even though there was a mutual agreement between him and the local authority representatives, the workshop owner continued to breach the agreement. The workshop situated on the reserve catering to a red pickup at Niles Street, Grove. Rambarran said he reported the matter to the police. He said the matter was then taken to the Neighbourhood Democratic Council (NDC) but he noted that he went to the Local Government Ministry instead. He said the ministry instructed the NDC to have the workshop removed and letters were issued to the owner for the removal but he still did not comply. Efforts by Stabroek News to contact a representative of the NDC who dealt with the matter proved futile. The chairman of the NDC and two councillors visited the workshop on Wednesday, Rambarran said adding that they indicated that it would not be a problem to build on the reserve and that they would speak to the workshop’s owner about the blocking of traffic. He explained that he emailed the secretary of Minister in the Ministry of Local Government Norman Whittaker, who then told him that he handed the instructions to the necessary authorities. Rambarran pleaded for the assistance of the Minister of Local Government. “If what the NDC is saying is [that it is] okay to build, I am advising people everywhere to take the opportunity and build on the reserve, once you are not blocking traffic, according to the chairman of the NDC,” he said.